Over the past ten days or so I've been fishing a few times. None of the sessions were very long (ranging from half-an-hour to a couple of hours) and the results varied quite a bit. The interesting thing is that I used identical tackle on every occasion basically my bass spinning gear. I tried piking, carping and bassing. 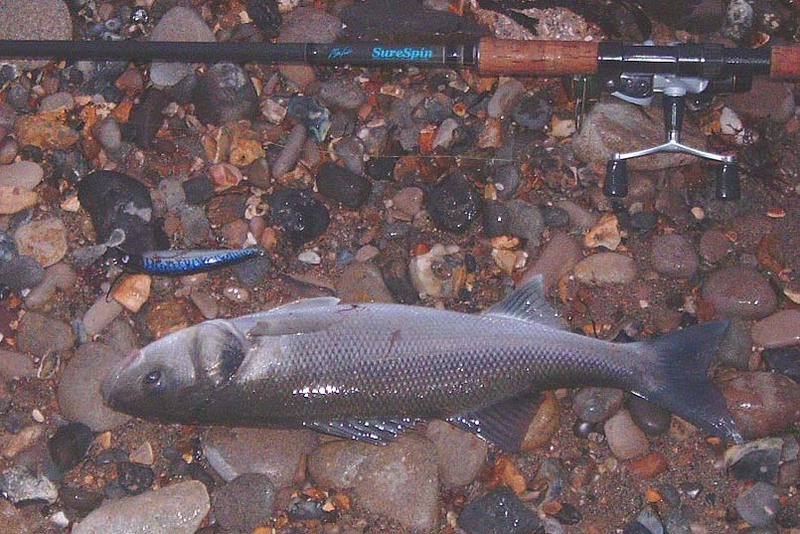 The coarse fish you can read about on the freshwater page and here I'll just mention the bass. I had a couple of blanks on lures and on bait, in both cases there seemed to be nothing doing. I also fished with a couple of pals one sparkling fresh morning and had two fish out of the eighteen caught on lures (I was outcast and outfished). On the last trip I improvised after finding my chosen spot unfishable (tide too low) and had a couple more bass, so all in all quite satisfactory. The most interesting session was the latest one when I went to Swanage. As I say I walked to my favoured spot at dawn only to find that the tide was further out than anticipated. The kelp was so dense that I would have needed a 'flying' lure to avoid the snags. I was a bit disappointed but decided to have a chuck on the way back to the car. My spirits rose when (near the pier) I had a pull and next cast hooked a fish. 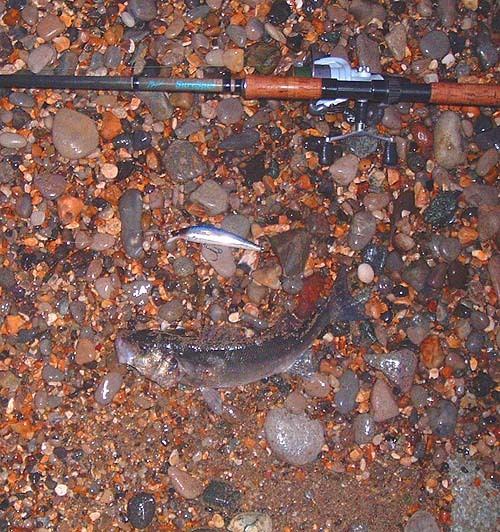 It turned out to be my smallest bass of 2005 (just over a pound) but it was such an incredible, bristling ferocious little fish that I was not too bothered by its size. As I beached the fish it curled its little body into a stiff curve, flared its gills and raised its dorsal fin so the spines were vertical - fantastic! Anyway, encouraged by my success I decided to have a couple of casts just beside where I had parked the car on the sea front. On a recent trip I'd noticed lots of sandeels in the water along that bit of beach and though that it might hold a fish or two. While I was casting three blokes from East Anglia (Lowestoft I think they said) came down to watch me. We passed the time of day and I suggested a couple of spots that they could try during their weekend's beach casting trip. Apparently their local fishing had been fairly dire of late and they were hoping for something better in Dorset. After five minutes they went back to their car (parked next to mine) and began to unload their gear. 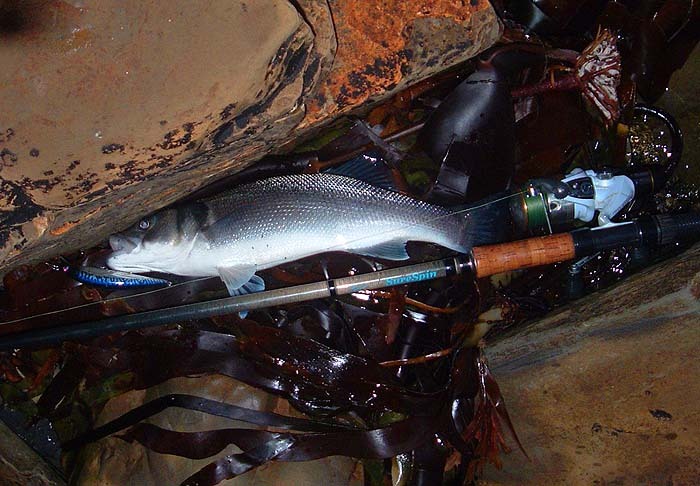 I moved along ten metres for another cast and at long range my lure was hit hard and fast. The fish kept deep at first so I was thinking 'wrasse' but then it boiled on the surface and showed a silver flank. It wasn't a big bass (1.5-2.0 kg) but it fought like hell and it was some time before I landed it. I gave the Lowestoft lads a shout and one of them came down to look. He said that he would have been well pleased with a fish like that - and so was I! 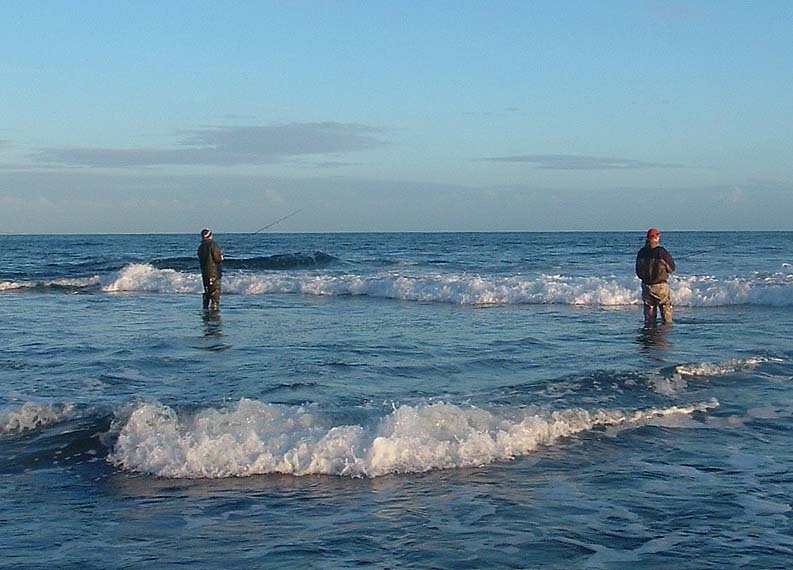 Jon and Lee fishing the surf. --- and a better fish.